I’m an Aussie vet and conservation scientist working at the interface of wildlife health and species conservation. Can you tell us about how you got involved with conservation? As a kid, I was chuffed to score my first proper job cleaning up after animals and since then I’ve spent every day mucking in with all creatures great and small in zoos, wildlife parks, clinics, breeding centres and in the field. Throughout high school and then vet school, I saved up all my pennies to travel for wildlife volunteer work in Australia and overseas. I also undertook research and training programs to learn a range of skills from experts in different disciplines. After working as a vet in Darwin in Australia’s far north, I traded equatorial heat for the UK to undertake a MSc in Conservation Science at Imperial College London. My MSc project on wildlife health and conservation was based in Borneo. Collaborating with local wildlife authorities and experts, I investigated how habitat loss and fragmentation affects patterns of parasite infection in wild elephants. 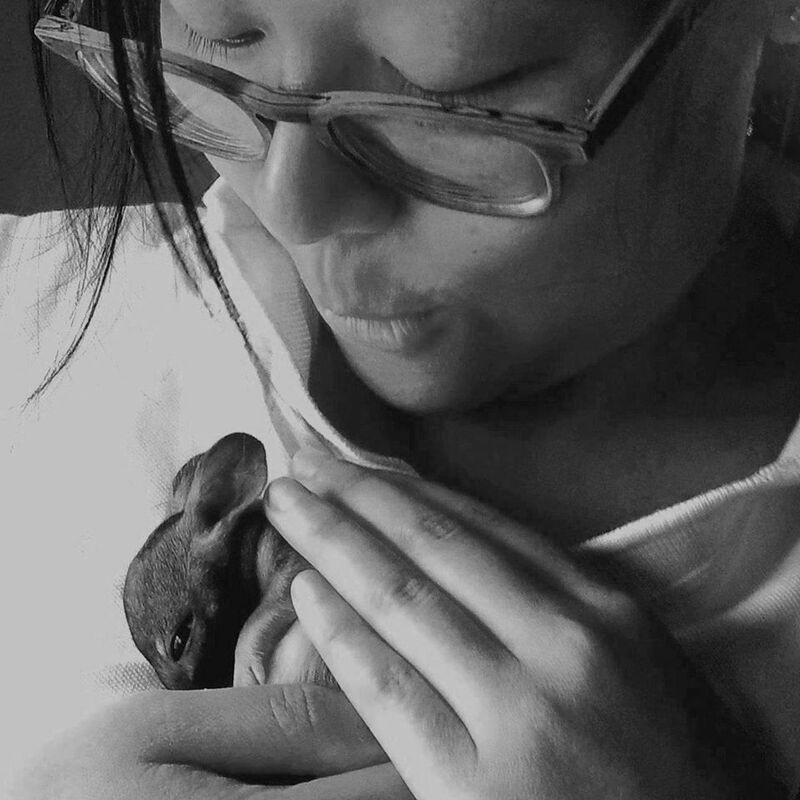 Constantly working with sick, injured and threatened wildlife during some of the most stressful moments in their lives, I developed an interest in the relationship between stress and health in the context of wildlife conservation and that’s what I’m working on currently. I’ll ask the question that everyone is thinking – what is a Woylie? I’ve been lucky enough to have worked with some pretty wild and woolly creatures but to be honest, before I started studying them, I had never even heard of a woylie before. That’s how mysterious they are. Also known as brush-tailed bettongs (Bettongia penicillata), woylies are very unique, small nocturnal marsupials who perform vital ecosystem services. 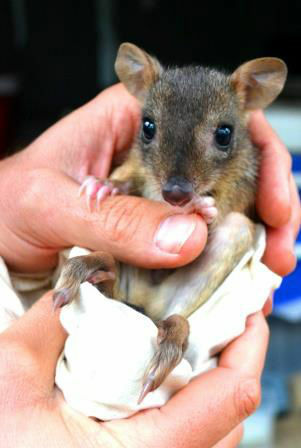 Not only are woylies intriguing little critters, their conservation story is also a fascinating tale of boom and bust. Once widespread and numerous across Australia, original in situ populations can now only be found in two pockets in south-west Western Australia. 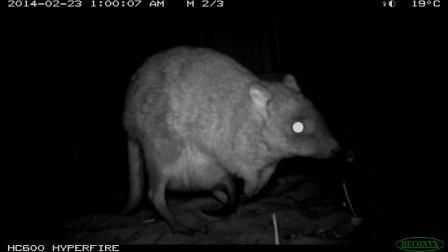 Woylies are now listed as Critically Endangered on the IUCN Red List. My research is part of ongoing investigations into causes for the species’ decline. 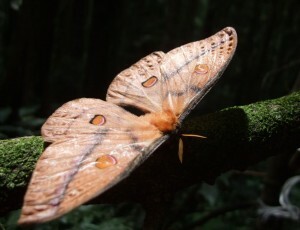 What do you hope your research will tell you about these critically endangered animals? We are trying to solve one of the greatest conservation mysteries: why have woylies declined so dramatically? And what can we do to protect remaining populations? Solving these mysteries is the key to preventing their extinction. 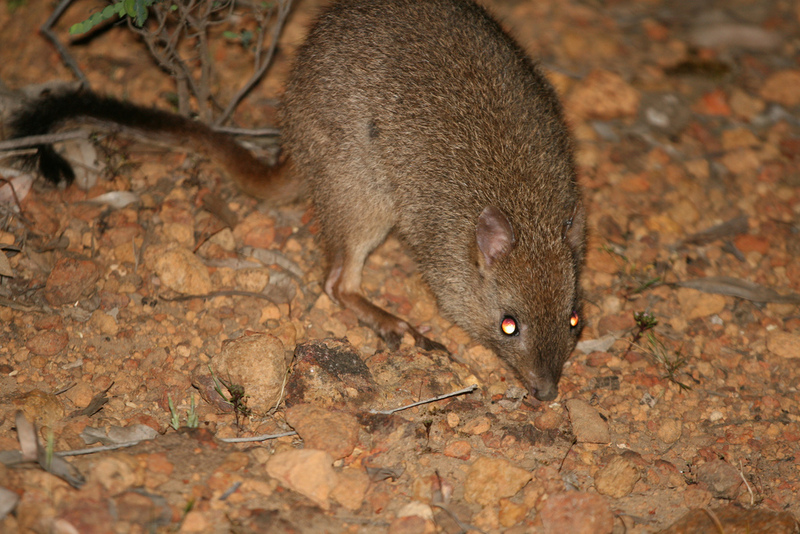 Evidence to date suggests that some unknown X factor(s) may be making woylies more susceptible to disease which then leaves them more vulnerable to predation by introduced predators including foxes and cats. My research is looking at whether stress is one of those X factors. "We are trying to solve one of the greatest conservation mysteries: why have woylies declined so dramatically?" Stress in animals might be new to a lot of us, tell us more. We know that when we’re stressed, say by work, exams, trauma or grief, our immune system may be compromised and we might be more likely to get sick but the relationship between stress and health in wildlife is rarely examined. This is particularly concerning because wildlife face many challenges, or potential stressors, ranging from climate change to habitat loss. My research focuses on the central question: In the context of wildlife conservation, what is the relationship between stress, immune function and infection patterns? I hope this work can aid efforts to conserve healthy populations of endangered wildlife in the face of ongoing threats. 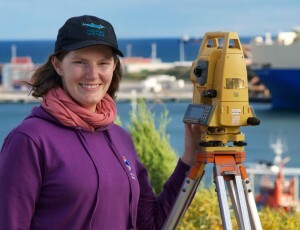 What does the day in the life of a Woylie scientist typically entail? Working with critically endangered nocturnal marsupials is about as far away from a regular 9 to 5 job as you can possibly imagine. There’s no regular timetable. The work is very dependent on conditions and coordinating with other people’s schedules as I work at several different sites with numerous collaborators and volunteers. 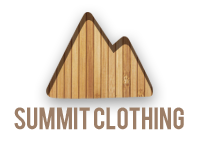 You need to think quickly, respond fast and learn to pack a lot of field gear in record time. 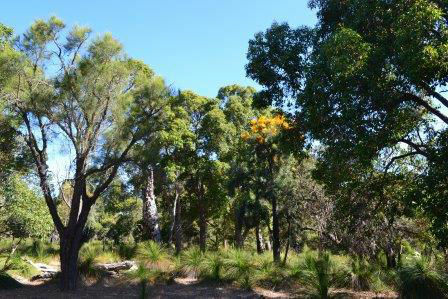 I work with woylies ex situ and in situ including fenced reserves and remote bushland. Locations range from close to metropolitan Perth to several hours drive away. As the woylies are active at night and in the early hours of the morning, we too adopt a twilight existence. We cover a lot of ground, maneuvering through the bush by torchlight, setting traps, collecting animals, conducting examinations, collecting samples and releasing animals back where we found them. Then it’s time to head back to campus to collate data, organise samples and clean equipment and gear in preparation for the next field trip. As we’re trying to examine trends over time, different seasons and populations, fieldwork is pretty non-stop throughout the year but if we’re lucky, there will be a moment here and there to do other essential things like: processing and analysing blood, faecal and parasite samples, meeting with supervisors, colleagues and collaborators, planning experiments, sourcing supplies and equipment, catching up on reading about the latest research, consulting experts for advice, making presentations to spread the word about woylies, writing papers…and other trifling matters like meals and sleep! "Working with critically endangered nocturnal marsupials is about as far away from a regular 9 to 5 job as you can possibly imagine. " It sounds like a wonderful, if hectic, lifestyle. Can you tell us about the highlights? Every day I am lucky enough to witness some of nature’s most secretive wonders and work with amazing animals and fantastic people on solutions to problems that I hope will create the kind of future I’d like subsequent generations to enjoy. The feeling that you can “be the change you want to see in the world”, that brings about a great sense of job satisfaction. I also love the sense of being part of a larger movement “fighting the good fight”, being a part of a worldwide community of like-minded, motivated people. While some complain of work being ‘boring’, this word doesn’t even exist in wildlife conservation. In collaborative multidisciplinary research, I’m constantly coming into contact with people from a wide range of different sectors and fields so I’m always learning new things and discovering new avenues for investigation. On the other hand, long periods of fieldwork can be hard. Do you have any experiences to share with anyone interested in this field? I think it is important for anyone considering wildlife conservation work to go into it with their eyes wide open. There is no glossing over the personal, financial, physical and emotional costs of this work. Moving around constantly to work with wildlife entails a nomadic lifestyle which may not suit everyone. In addition, though few in conservation are motivated by financial reward, it is undeniable that a significant challenge is financial hardship (relative to our peers) as we PhD students live on a stipend/scholarship which amounts to less than the minimum wage in Australia. These scholarships are competitive and they do not cover research costs so, in my case, I had to compete for further funding from several different organisations. This lack of financial security can be stressful. The work is also very physically demanding. Hours are long and irregular which can challenge even the fittest amongst us. 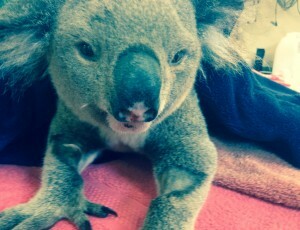 Other difficulties that are rarely mentioned include the emotional toll of working with wildlife including dealing with unpredictable catastrophes such as the devastating effects of bushfires. However, some of these sacrifices and challenges have upsides, for example moving often means making lifelong friends from across the globe and financial conditions mean we lower our consumption so contribute even more to conservation! TOP LEFT: Ideal Woylies habitat. Woylies were once found in all different types of habitat across Australia from coastal grasslands to arid zones. TOP RIGHT: Steph holding a Woylie joey, joeys stay in the mother’s pouch for a few months then become young at heel, able to hop around with mum and returning to the pouch to suckle. BOTTOM: Woylie (Bettongia penicillata) (photo: Arthur Chapman, Creative Commons). All images copyright Stephanie Hing, and may not be reproduced without permission. Perhaps a tough question at the moment, but are you optimistic for the future of conservation in Australia? 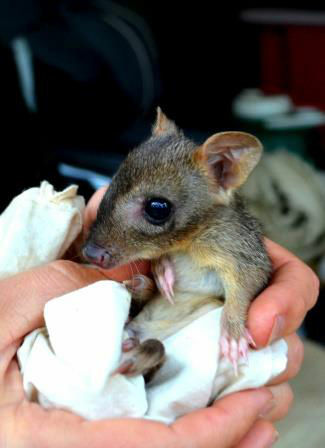 Currently, there are very significant challenges for wildlife conservation research in Australia. 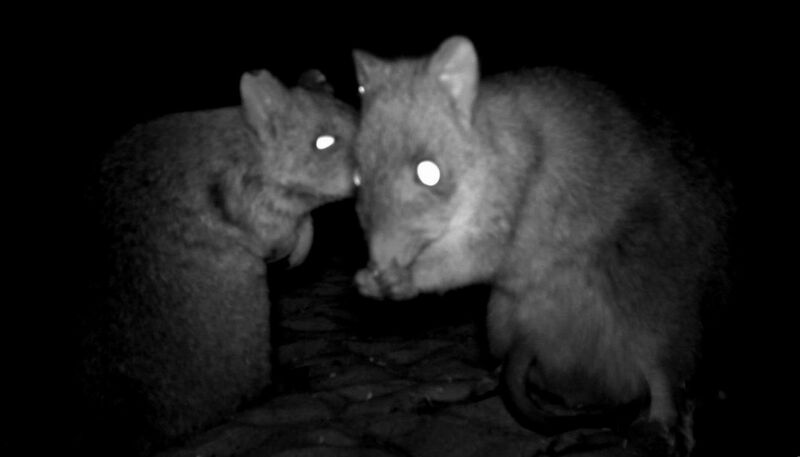 As logging trucks laden with timber rocket past us at our field sites, feral cats and foxes are spotted roaming the landscape and extreme weather events threaten our study populations, it is hard to ignore the myriad of threats facing our wildlife. In order to conserve biodiversity in Australia for the future, we need to conduct research to understand how different species and ecosystems respond to these threats but this is difficult given resource limitations. Cuts to research funding and the lack of government support available for science and conservation in Australia is making it extremely difficult for us to effectively protect globally significant species and ecosystems. For example, currently there is no state or federal government funding for woylie conservation despite their critically endangered status. The one thing which makes me optimistic is working with a network of passionate people who, despite the challenges, are determined to dedicate their lives to conserving our unique flora and fauna. And lastly, any advice for aspiring conservationists amongst our readers? 1) Skills – Working in such a varied and unpredictable field means you need to be prepared to respond to a wide range of situations from how to dig a ute out of the mud with nothing except a hessian sack and your bare hands to figuring out how to handle a fractious animal without injury to you or them. The best way to equip yourself is to become a treasure hunter, the treasure being skills. Pursue volunteer or work with as many different people in as many different fields and sectors to acquire all the skills you need to cope in different situations. 2) Contacts – Make contact with people doing the work you’d like to do. Opportunities won’t be handed to you. You need to knock on doors for them to open. Some people have reservations about ‘bothering people’ or ‘seeming desperate’ but have no shame. Experts are often happy to hear from enthusiastic people with similar interests and clear goals. For example, I often contact the ‘corresponding author’ on inspirational papers in peer-reviewed scientific journals to reach out to the experts. Attending (or even better – presenting at) relevant seminars, workshops and conferences are great ways to make contacts as well as using online tools including webinars and social media. You don’t necessarily have to take ‘no’ for an answer. Think laterally. If you can’t leap a hurdle, develop strategies to work around it. 4) Should, could, would – Speaking to countless friends and colleagues, I’ve found that even the ‘best and brightest’ people struggle with career decisions based on conflicting ideas about what they ‘should’ do (based on obligations or expectations) , ‘could’ do (deciding between many options) and ‘would’ do (based on hypothetical ‘what ifs’). Personally, I would advise not taking too much notice of the ‘should’ and instead following your instincts. You will always do better and be happier following your heart. In terms of weighing up options, the best and quickest method to decide between all the different things you ‘could’ do is to close your eyes and give yourself 5 seconds to imagine your ideal life. Then choose the option that is closest to that! All too often I hear people say ‘I would do x but what if…’ For example, ‘I have always wanted to work with wildlife but what if…’Life is too short to base decisions on ‘what ifs’ that may not even happen so don’t let them hold you back. 5) Take care of yourself – Particularly when we’re doing conservation work that we are so passionate about, there is the tendency to get completely carried away with it all. However, working to our full potential doesn’t mean working until we burn out. I’ve seen too many wonderful, strong, capable friends working in conservation run themselves into the ground. We need to take care of ourselves just as well as we care for the animals and ecosystems we work with. This is a very eloquent and accurate depiction of life in the field of conservation biology, with some wonderful advice. Thank you!